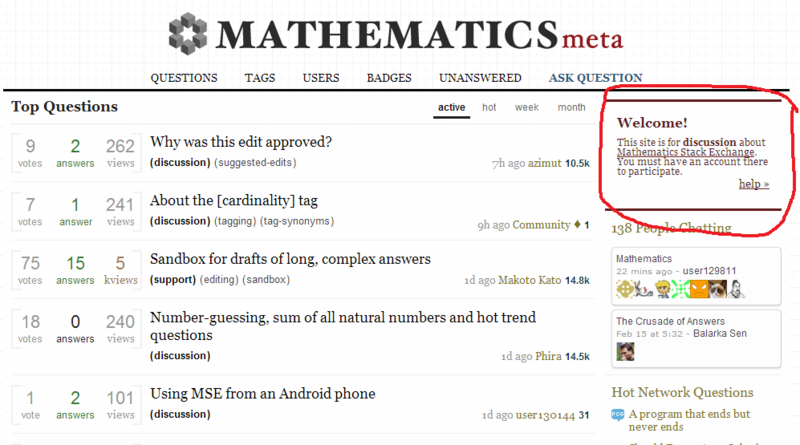 If I click on the "feedback" link at the bottom of the math main page, it sends me here. This is also the URL shown when hovering over the link. Edit: Daniel Fischer suggests this may be by design, as this is how the "feedback" links work on other sites as well. I had assumed that it would take one to a page with a form in which to leave feedback. Of course, once one knows the purpose of the meta sites, it can be seen as a place that one can leave feedback. However, I can also imagine that a new user might find this behavior somewhat confusing. It might be better to send users to this page which describes the purpose of the meta sites. This behavior for the link is indeed status-bydesign. Meta is the place to leave feedback about the site for the community to vet, so it falls naturally that that is where we want to direct people to give their feedback. That's the part we already know. This also doubles as a means to actually reach the corresponding site's Meta from the footer rather than needing to fly all the way to the page top. Not immediately apparent if your goal is to "Go to Meta", but the name was intended to reach those whose goal is to "Leave feedback". I don't think throwing them at the help center article directly is too fancy. Especially if a user is already familiar with how the site works, it's extra clicks for no benefit. Ideally we want it so that new users would get a notice of how to find instructions easy enough, but can skip them and head straight to posting their feedback if they know what they're up to. A new user who ends up on Meta does actually get an informative note about what the site is... sorta. I've indicated it in the following screenshot. I think it's pretty clear from this screenshot that this is terribly insufficient, though - I think that to make the purpose of Meta as a feedback destination, we should look at touching that up over changing the link. It's off to the side, and with the site's color design, it's not very apparent that this is valuable for a new user to read. It also currently just goes to the main Help Center page, so pointing to the Meta portion you suggested earlier would probably be better. And then making it easier to discover in some way - perhaps a large hero bar similar to the one new users get when viewing the main site. Could definitely use some nice attention to it somehow. Not the answer you're looking for? Browse other questions tagged bug status-bydesign help-suggestion . The help page on privileges doesn't mention accepting answers.